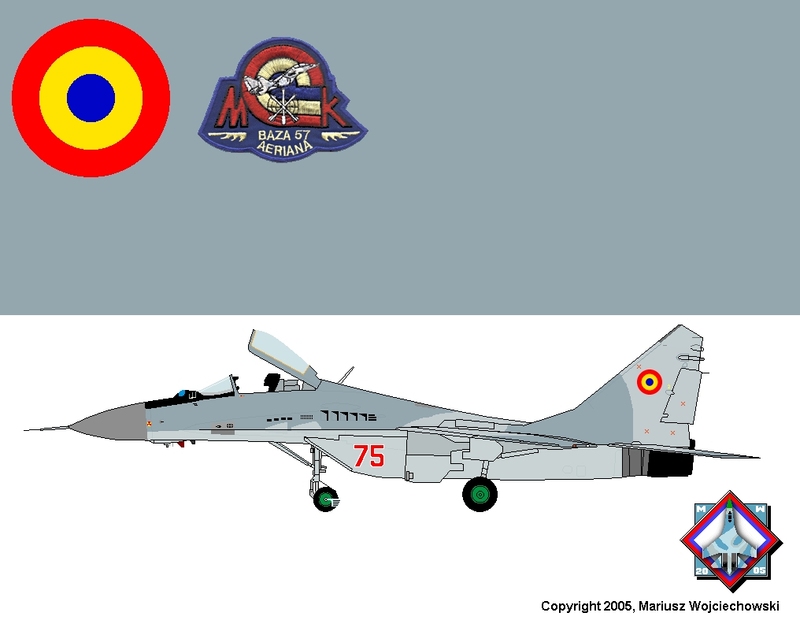 In 2003 official end of the service in the Romanian air force; since then MiGs are parked in open air at Constanta airfield (at least 12 MiGs), probable not flightworty. 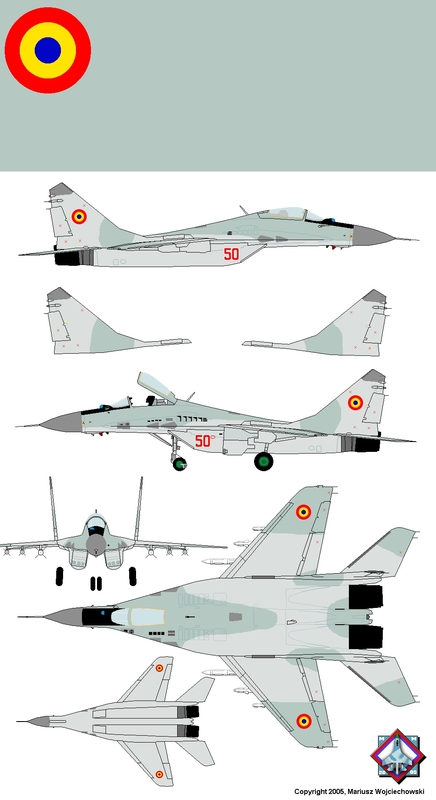 Four MiGs: 1990, 1992, , 1994, 1998. To replace losses, between 1992 and 1993 five MiGs were bought from Russia and Moldova. 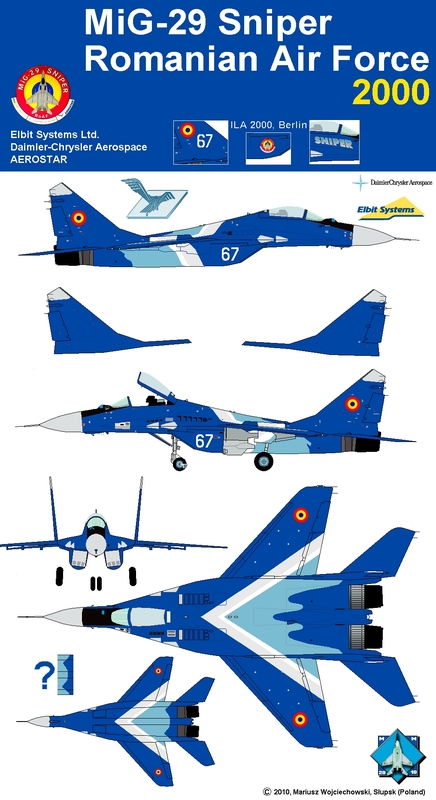 First MiGs delivered shortly before revolution in 1989, but first flights in 1990 with Romanian roundels. Never fly with socialist Romanian star. In 2000 one MiG-29 (no. 67) served as demonstrator of modernization programme, called Sniper, prepared by DASA (Germany), Elbit (Israel) and Romanian aeronautical company Aerostar S.A., Bacău. Due to lack of money, programme wasn't realised. MiG-29 "Sniper", Romania 2000. State in early 2000: stripe on wings and fuselage was initially grey-white [sic! ], in Summer 2000 (ILA exhibition in Berlin) all white. White number 67 was on intake, later (with a different numerals shape) on fin, replaced by round logo. Small area underside is not clearly visible on photos, so may be different a little. Drawing accuracy: 100% (except small area underside). Overhauled MiG-29 no. 75, Romania 2001. Probably one and only overhauled in 2001. Drawing accuracy: 100%.